, a very learned divine of the Roman catholic persuasion, was born in Dublin in 164O. After being taught at a grammar-school for some time, he was sent to France, and had his first academical learning at the college of Nantz, whence he removed to Paris, and completed his studies in philosophy and divinity, in both which he attained great reputation, as he did likewise for his critical skill in the Greek language. He taught philosophy and rhetoric in the Grassin college for some years: but at length returning to Ireland, was, with considerable reluctance, prevailed upon to take priest’s orders, and had some preferment while the popish bishops had any influence. When James II. came to Ireland, Dr. Moor was recommended to him, often preached before him, and had influence enough to prevent his majesty from conferring | Trinity-college, Dublin, on the Jesuits, to which he had been advised by his confessor father Peters. Dr. Moor being made provost of this college, by the recommendation of the Roman catholic bishops, was the means of preserving the valuable library, at a time when the college was a popish garrison, the chapel a magazine, and many of the chambers were employed as prisons for the protestants. But the Jesuits could not forgive him for preventing their gaining the entire property of the college, and took advantage to ruin him with the king, from a sermon he preached before James II. at Christ Church, His text was, Matt, xv, 14. 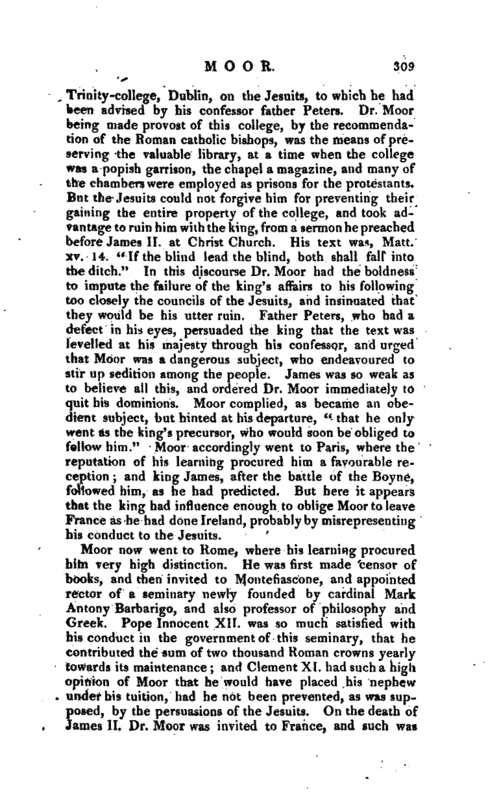 “If the blind lead the blind, both shall fall into the ditch.” In this discourse Dr. Moor had the boldness to impute the failure of the king’s affairs to his following too closely the councils of the Jesuits, and insinuated that they would be his utter ruin. Father Peters, who had a defect in his eyes, persuaded the king that the text was levelled at his majesty through his confessor, and urged that Moor was a dangerous subject, who endeavoured to stir tip sedition among the people. James was so weak as to believe all this, and ordered Dr. Moor immediately to quit his dominions. 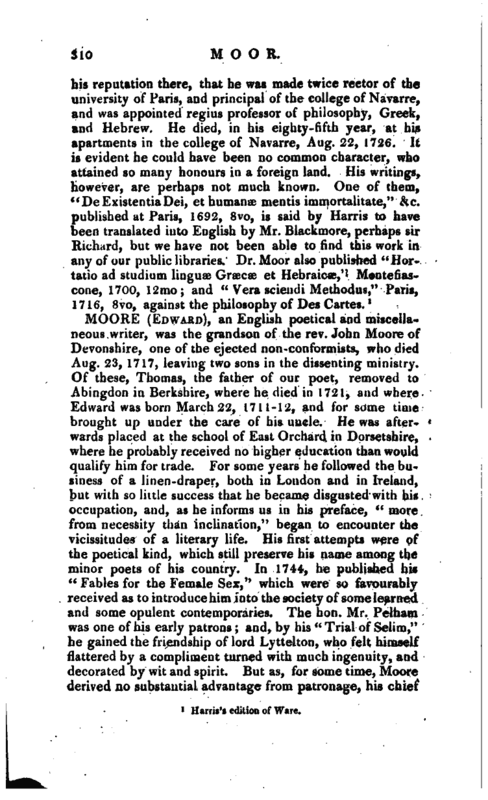 Moor complied, as became an obedient subject, but hinted at his departure, “that he only went as the king’s precursor, who would soon be obliged to follow him.” Moor accordingly went to Paris, where the reputation of his learning procured him a favourable reception; and king James, after the battle of the Boyne, followed him, as he had predicted. 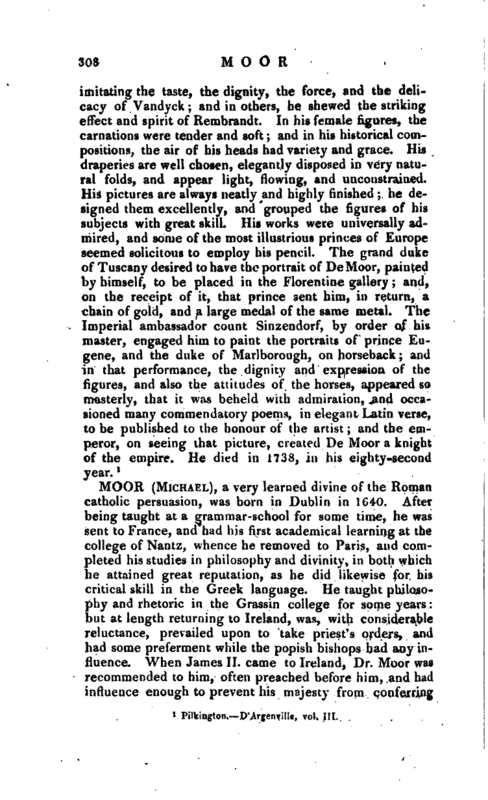 But here it appears that the king had influence enough to oblige Moor to leave France as he had done Ireland, probably by misrepresenting his conduct to the Jesuits.